Don't you just love to knit Fiesta Baby and with Addis. Beautiful knitting my friend! I love fresh flowers and keep them as long as they are blooming in the yard. I seldom buy them! It sounds like you had a wonderful Thanksgiving, so did I! I did some shopping today... but ON-LINE! Have a blessed evening! HUGS! I hope you find LOTS of bargins on your shopping trip! I just finished a pair of socks I've been working on for a while...feels so good to complete a project. I have never tried to toe up style. Might have to attempt that next year. Currently working on a rolled brim hat. something mindless and easy! Love love you colorful flowers for you festive Thanksgiving dinner. Love you knit projects. I know you and Hil must of had lots of fun shopping yesterday in Santa Cruz. What fun. Are you getting rain like us up here in GV? My Guy and I went to Truckee to play in Teresa's studio. The newly fallen snow was so so so beautiful. I was thinking about how much you would have loved seeing it!!! Happy weekend to you Auntie Stacy! 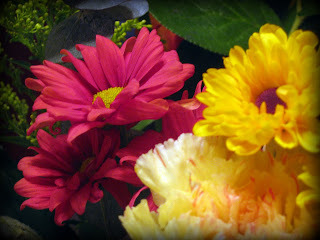 Glad to hear that you had a wonderful Thanksgiving (with flowers - what a lovely thing to find on the table!). I love the yarn that you are using on your socks. I've never finished a pair, either, so I'm pulling for you! Yipee! 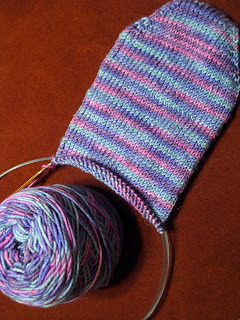 Sock knitting -- I can't wait to see them finished. Hope you had a great Black Friday! The linen stitch is just beautiful. 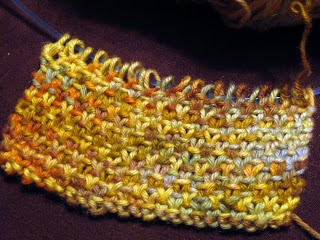 I want to make a scarf out of left-over sock yarn. I cant imagine how crazy Santa Cruz was on Black Friday. Hope you survived! Your knitting projects are lovely. Here's to finishing the socks! I'm such a freeze-pants lately I can't stand to have anything but wool socks on - and I only have 2 pairs! I have some Knitpicks sock yarn I need to get on the needles. Fresh flowers are wonderful. We occasionally receive some from some lovely friends...nothing like them to perk you up! The flowers are beautiful! I just love having fresh flowers in the house...esp. in the colder months. Pretty socks! Or pretty start to a sock. LOL!